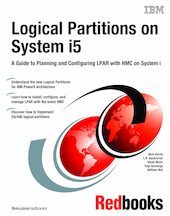 This IBM Redbooks publication gives a broad understanding of the new System i5 architecture as it applies to logically partitioned System i5 systems. This functionality is delivered through a new configuration and management interface called the Hardware Management Console (HMC). Reading this book will help you design your server partition scheme from scratch. We also discuss the requirements to create a solution to migrate from existing iSeries servers with and without logical partitions. This book will help you install, tailor, and configure logical partitions (LPARs) on System i5 systems. You will understand how to set up the server and HMC via the Guided Setup Wizard. We also cover the creation of multiple i5/OS partitions, where the OS could be IBM i5/OS, AIX, or Linux.